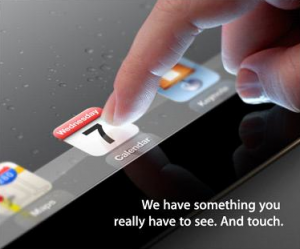 So there’s a rumor going around this morning that the iPad HD will have haptic feedback. That means you’ll be able to feel objects on the screen. Sandpaper would feel like sandpaper, for example. Very, very cool if true. And all this time we had the hint (from the invitation picture, above) all this time. We’ll see in a few hours! Update: Nope! No Haptic feedback. Previous Previous post: IPad HD?